From big top to round house, edgy cabaret and variety show La Soirée is moving from London's South Bank to Camden for a 55-date Christmas season from autumn 2011. The return to The Roundhouse follows 2009's sell-out run which broke box office records for the fastest selling show in pre-opening sales, grossing over £500,000 before the first night. The La Soirée ensemble is drawn from a collective of around 25 artists including burlesque dancers, comedians, circus sideshow and contemporary vaudeville acts. The show features a number of performers from 'La Clique', which ran at London's Hippodrome for nine months, scooping an Olivier Award in the process. This troupe first played together in Edinburgh and has since performed worldwide with sell-out shows in Paris, Sydney, Stockholm, Dublin, New York, Adelaide and, er, Blackpool. 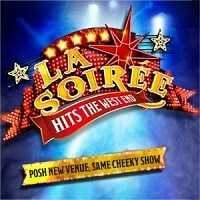 La Soirée is at The Roundhouse from 23rd November 2011 until 29th January 2012. The show features the bizarre and risqué and is famously unpredictable. Unsurprisingly, La Soirée is not aimed at those under 18 and none will be admitted, so get a babysitter for your 17-year-old. Tickets for the 10-week run are available now, priced £25 for rear stalls and £40 for ringside seats. Roll up. Nov 2011:Special Offer: Two for One tickets for Office Party (the show that's a party) until 21st January 2012!